Hot Kia Procee'd in 2013 | What Car? A new hot Kia Procee'd is expected on sale by the end of 2013 a full year after the new Procee'd is due to be launched at the Paris motor show in September 2012. Before that, a new five-door Cee'd hatchback and SW estate version will be unveiled at the Geneva motor show in 2012. There's no word yet on just how quick a sporty Procee'd will be although we'd expect it to at least match the Megane Renaultsport's 247bhp. However, Kia insiders say they want their cars to have the performance to match their cars' new sporty look, as showcased in the three-door Picanto and its Frankfurt concept car revealed last week. 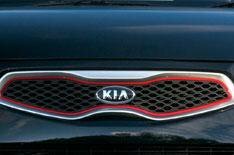 All future Kias will get this sporty look. The new Kia Procee'd is set to be even more coupe-like, following the example set by Renault and Vauxhall with the Megane three-door and Vauxhall Astra GTC. As well as a new Cee'd and Procee'd next year, Kia plans to replace the Carens MPV. A new version is expected sometime between the Geneva and Paris motor shows. It will be bigger than the current Carens making it more of a Ford S-Max rival. It will also replace the Sedona seven-seat MPV. Kia says customers who want a large seven-seat vehicle will choose its Sorento 4x4.